CB is hosting an afternoon of design talks at Bath Digital Festival. Bath Digital Festival is set to return on 23-27 October for its most ambitious year yet. The week-long festival of everything to do with digital technology will encompass 85 talks held in various locations around the city. You can pick up a wristband that will give you access to the full schedule of talks for just £15, which is ridiculously cheap for what's on offer. 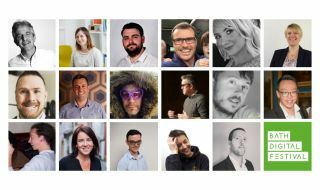 Most excitingly, we at Creative Bloq have gathered together a group of awesome designers from top studios for an afternoon of inspiring talks, which will take place on 23 October from 2pm (scroll down for more on that). Make sure you reserve your place on the talks you want to attend (hurry, many are booking up fast). To help you plan what you want to see, the mammoth festival is broken down in to a different theme each day. Within those themes are specific streams aimed at hobbyists, businesses and tech professionals, so there's a little something for everyone. There's even a range of child-friendly events for parents to bring their kids to, and get them a head-start with their coding skills. Read on for our pick on the talks you'll want to reserve your place on. Creative Bloq has teamed up with BDF to bring you an afternoon of talks from designers and art directors from some of the best creative studios around, including Supple Studio, Fiasco Design, Halo, Mr B and Friends and Mytton Williams. Reserve your spot for advice on building brands that people remember, insights into the magic of side projects, and a controversial look at why it might be time to trust your instincts rather than your audience. This full-day event will explore the most exciting developments in the web industry and user experience design. There's a cracking roster of speakers: Jonny Rae-Evans will explore how to design for good (or, as he refers to it, 'the subtle art of not killing anyone'), Mud's Michelle Barker will dive into CSS Grid, Mike Brondbjerg will show you how to use data as a creative material, and Tara Ojo will offer a look at the web world though the eyes of a 'junior' dev. Artificial intelligence is a hot topic at the moment, but where does it leave creatives? In this talk, Edit's Rob McGowan muses on whether AI can ever truly be considered autonomously creative, and explores a future where AI can be used as a tool to build connections in society and open up new possibilities. Following the talk there will be panel discussion that digs into the ethics around using AI. There's no denying the power social media can have over your career, if you know how to wield it correctly. In this talk the clever people who crafted a brilliant online presence for startups Hugg and Swoon share their insights on how to build a powerful digital brand. Love Lego? Got coding skills? Combine the two to build a fearsome bot, then battle your creation against other teams' robots until a champion is crowned. Sam Ramsay, the founder of Lego Robot Club, will be offering guidance to help you fulfil your true potential. Just beware the house bots!